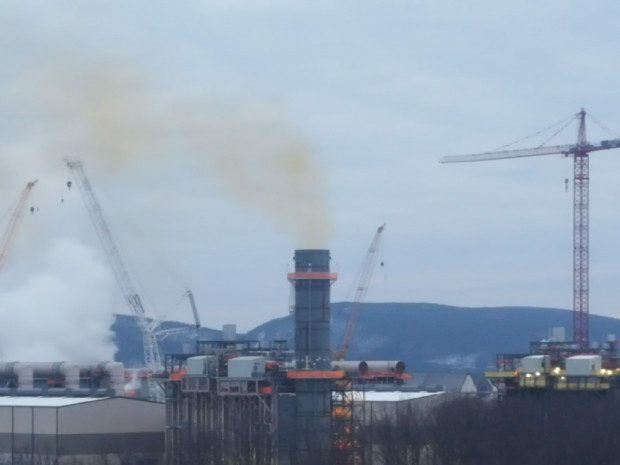 PHOTO COURTESY: KIM CRINELLA Pennsylvania environmental regulators are investigating health complaints after Invenergy's Lackawanna Energy Center natural gas power plant under construction in Jessup Pa. began spewing plumes of colorful smoke. The company says the emissions are temporary and part of a planned commissioning process. SCRANTON, PA (State Impact PA) Pennsylvania environmental regulators are looking into health complaints after residents say a natural gas power plant being built near Scranton started emitting noxious, greenish-yellow smoke over the weekend. “I live a half-mile from the plant. It was burning my nose, throat, sinuses and chest,” said Jessup resident Rella Scassellati. A state Department of Environmental Protection spokesman confirmed the agency is investigating the complaints, but could not provide further details Wednesday. Photos and videos posted on social media show the plant billowing thick smoke.